service. Get a better deal with Stena Line. 17 ferry routes Stena Line operate online using the drop down menu above. The traffic statistics of over 17 million passengers (translating to 3.2 million vehicles) travelling with Stena Line in 2004 certainly qualify this. 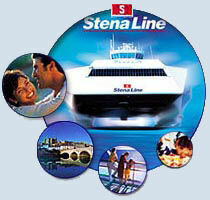 Stena Line now operates four routes in the UK, after aquiring Sealink British Ferries in 1990. Of course. All ports that Stena Line travel from offer parking facilities onsite, or very nearby. There is usually a charge for parking, so please inquire before you travel and arrive prepared: See port information pages on the Stena Line website for details. Are there any limits to the amount of luggage I can take on Stena Line Ferries? Day trip travelers on Stena Line and other operators are restricted to one piece of hand luggage, and advised not to exceed that limit for any reason. Foot and rail passengers who are traveling for longer than 24 hours are permitted to take only two items of luggage in addition to their allotted hand luggage. For passenger safety reasons Stena Line allow only hand luggage on any of the passenger decks on the Stena Lynx and Stena HSS. Passengers' baggage must be strictly stowed away during the crossing. Do children pay to travel on Stena Line Ferries? All children under the age of 4 travel free on Stena Line Ferries. Children over 4 years but under the age of 16 travel at the same rates as adults. There is, however, a reduction on adult fares if traveling by foot. Are there facilities for children onboard Stena Line Ferries? On board all of Stena Line's ships you will find Baby Changing facilities and children's menus in the restaurants. Stena Line - HSS 1500 Explorer - Playroom and a children's cinema. Children's entertainers onboard selected sailings during summer holidays. Stena Line - Superferry K. Beatrix - Creche on selected sailings only and a playroom. Stena Line - HSS 1500 Voyager, Superferry Galloway & Superferry Caledonia - all have a playroom available for children. Children's entertainment is available at weekends and during school holidays on the HSS 1500 Voyager. Stena Line - HSS 1500 Discovery - has a playroom and also children's entertainment at weekends and during school holidays. It is best to phone ahead to remove any uncertainty regarding your travel arrangements. Please let Stena Line know in advance on 08705 70 70 70 so Stena Line can make arrangements for your travel. Are there places to eat and drink onboard Stena Line? Yes. All Stena Line ships offer at least one restaurant, bar and lounge area for the enjoyment of their customers. See onboard information pages from the Stena Line website for facilities specific to each route and ship you are traveling on. Where can I buy tickets for Stena Line? Use the booking engine to search for Stena Line tickets, and enjoy this excellent operator's facilities to travel across the seas in style and luxury. Book your Stenna Line group and coach travel party ferry tickets to or from the UK, Ireland and Holland online in advance to benefit from Stenna's exclusive online special offers of up to 40% off standard brochure fares on all ferries. Book your Stena Line ferry tickets to or from the UK, Ireland and Holland online in advance to benefit from Stena's exclusive online special offers of up to 40% off standard brochure fares on all ferries. Book your Stena Line short break or holiday exclusive online and enjoy special offers of up to 40% off standard brochure fares on all ferries. The best prices for Fast Ferry and Ferry Travel to Ireland, Holland and Britain. Book your Stena Line ferry tickets to or from the UK, Ireland and Holland online in advance to benefit from Stena's exclusive online special offers of up to 40% off standard brochure fares on all ferries.